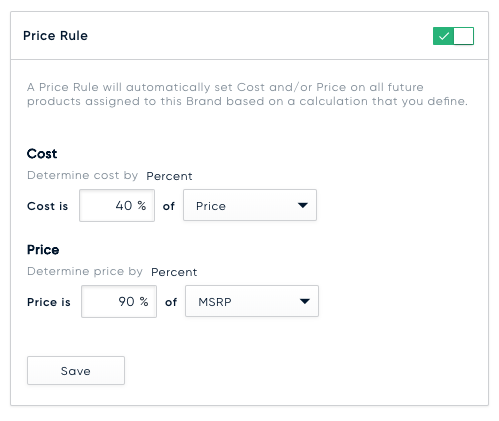 We introduced Brand Price Rules as a way to help you set and maintain pricing in your Settings. What is a Brand Price Rule? A Price Rule is a way to set a Cost and Price on products based on the steps you define. A Price Rule has some of the following key capabilities. 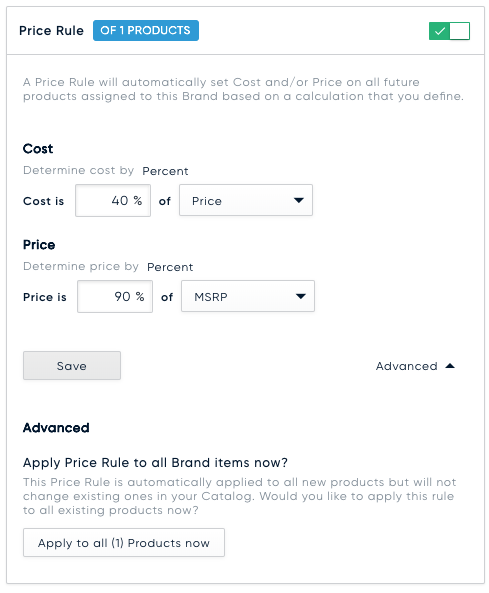 A Price Rule is applied automatically when a new Product is added to a Quote or your Catalog. Cost and Price are set as a factor of MSRP. You can manually apply a Price Rule to existing products. A Cost or Price set by a Price Rule can always be overwridden later. To get started with Price Rules you'll start by navigating to Settings and then to Brands. Alternatively, while quoting we will identify products that are a good candidate for a Price Rule and provide guidance to start this process from the product sidebar. Next, click on an existing Brand to open its detail view and toggle the Price Rule on to reveal the Price Rule options. 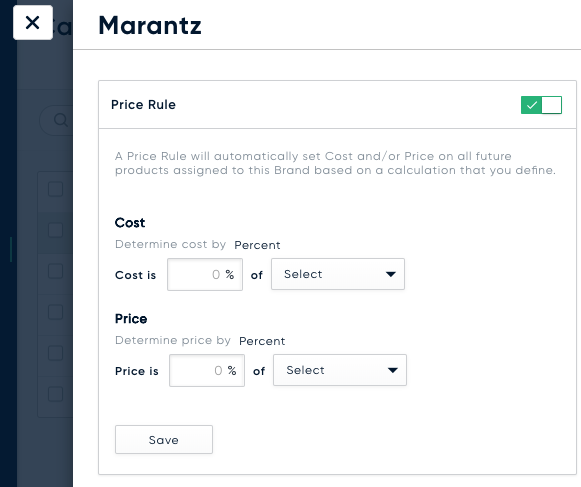 With the Price Rule enabled, you can now describe how the Cost and Price of items assigned to the Brand should be calculated. In the example below, the Price has been set to 90% of the product's MSRP and Cost to be 40% of that calculated Price. Today we only allow Cost and Price to be a percentage of the referenced value. With the Price Rule configured, clicking "Save" will enable the Price Rule for all future Products added to your Catalog and/or Quote. At this point you have the option to apply the newly enabled Price Rule to all current products in your Catalog. We provide a count of how many products will be updated for your reference in the "Apply to all" button.